Showdown in an alternate timeline! Apollo tells Baltifer he'll recreate the temporal event that allows crossover to the other timeline if only Baltifer will stop his attack on the humans of Cache. Baltifer agrees. As Apollo flies out in his temporal Viper and Zee activates the basestar's own new temporal weapons, opening a rift, the alternate Galactica suddenly de-cloaks and pirate captain Starbuck offers his aid to the human cause. As the battlestar pummels the basestar from without, alternate-Adama leads a revolt of the human prisoners within, killing Baltifer and taking control of the basestar. The temporal rift then erupts, dragging the alternate Galactica and the captured basestar into the original timeline, where they assist Galactica-actual in their own battle against the Cylons, right at the moment Apollo and Starbuck's Vipers originally vanished in "Memorial". The Cylon basestar is destroyed and the Raiders routed. The alternate Galactica and basestar then pass back through the rift to their own timeline before it closes for good. Apollo and Starbuck are joyously reunited with the fleet. Young Zee feels confident he can repair the temporal battery, but Apollo and Starbuck warn them all against it after what they've seen. As Baltifer realizes that Apollo is from another timeline, he figures if the Cylons could travel there, they can be the masters of two galaxies. This implies that they are still in the Cyrannus galaxy, which would place the story before "The Long Patrol", in which the rag-tag fleet enters a new galaxy. But if this story takes place so early in the chronology, the fleet would not be having the latest in what has apparently been a series of annual memorials to all the humans lost in the Cylon attack on the Colonies in "Annihilation". Taking this into account, I think it is better to imagine that Baltifer was being nondescript in his use of "galaxy" and meant their current galaxy and its divergent counterpart, not including their home Cyrannus galaxy, already conquered (more-or-less) by the Cylons. The ejection pod from Apollo's Viper looks similar to the one Starbuck used in the Galactica 1980 episode "The Return of Starbuck". 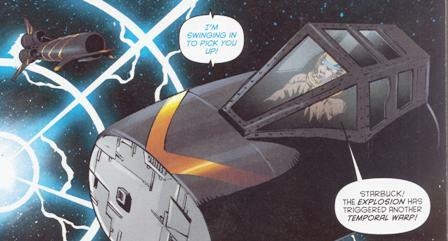 On the last page of the issue, having finally returned to their own timeline, Starbuck tells Commander Adama that he and Apollo have been gone months. That would be quatrons in Colonial terminology. How did the alternate Starbuck come to be in possession of the Galactica (as first seen in "Acts of Defiance")? And why is it that the alternate Adama never heard of a battlestar by that name being built (as also revealed in "Acts of Defiance")?